Sleeping in a hammock is a unique way to experience the woods. When out camping, learning bushcraft and even when just relaxing in one. As winter creeps closer the temperatures will drop, especially at night. Retiring our hammock passion simply because it’s getting colder is not an option. So we need something to keep us cosy when in a hammock during winter. The Thermarest Slacker Snuggler enables you to sleep out in a hammock throughout the year whilst staying warm and comfortable. Let’s take a closer look. When in a hammock the air can freely circulate around you, that’s one of the reasons hammock camping is so wonderful. However in colder temperatures this is not ideal as you are exposed to those cold drafts. You want something to slow the movement of air around you and insulate at the same time. 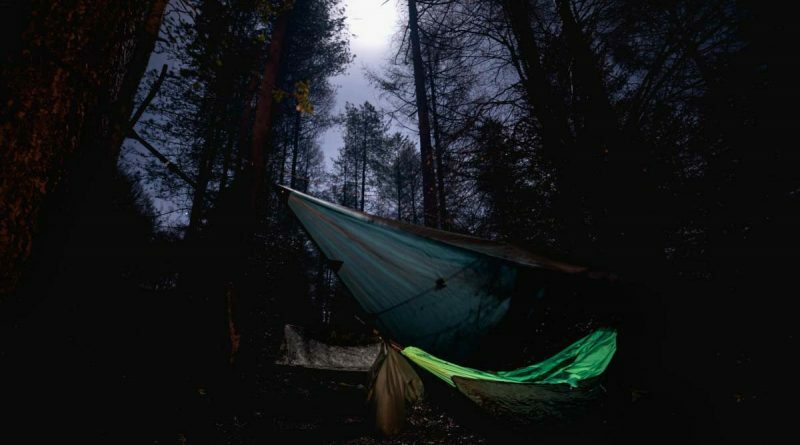 The Thermarest Snuggler is a synthetic underquilt designed to be used with Slacker Hammock range. An underquilt is basically half a sleeping bag that goes around the underside of a hammock and serves a couple of uses. It traps your heat that would otherwise be lost from under the hammock, removed by the air circulating around you. The underquilt also reflects your own body heat back towards you, thereby reducing your own radiative heat loss out to the cold air around you. Thermarest Slacker Snuggler keeping a Slacker Double Hammock warm and cosy on a late autumn night. There are a few versions available in the Thermarest Snuggler product line. I own the Super Snuggler and Slacker Snuggler which are both synthetic filled underquilts. The Super Snuggler for really cold conditions and the Slacker Snuggler for those slightly chilly nights. I went for synthetic underquilts as they handle moisture much better than anything else. Thermarest also makes a down filled underquilt called the Down Snuggler and this would be great for dry cold conditions. If you own a Slacker Hammock and Suspenders Hanging Kit then pitching everything is so simple. A Snuggler has at one end a loop of bungee cord and at the other a loop of fixed line with a length adjuster. You have to pass the bungee loop and fixed line loop through the carabiner at each end of the Suspenders Hanging Kit. Finally you adjust the length of the fixed line loop to get the desired tension. 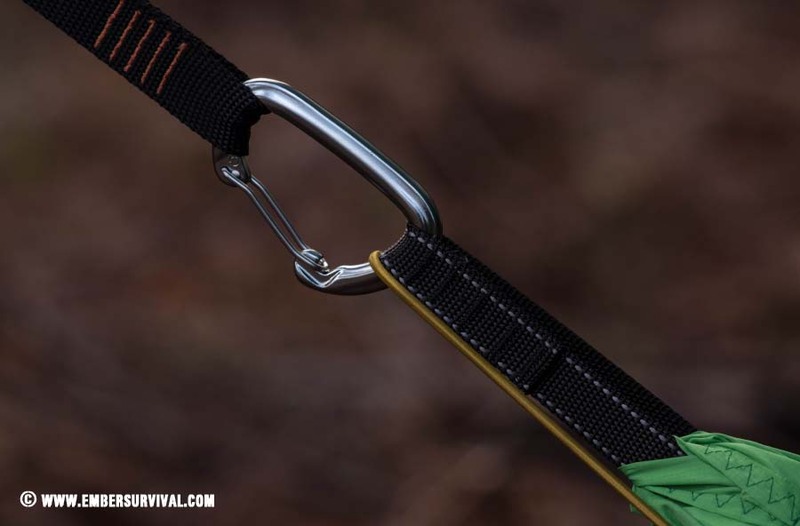 The bungee cord end automatically prevents damage being done to any fabric or lines when you climb into the hammock and affect it by your extra weight. The Suspender Kit is pre strung to a tree at each end and already holding the hammock, the Snuggler is the accessory you put on last. Here we see the Slacker Suspenders Kit connected via a carabiner to the strapping loop of a Double Hammock. The thin yellow cord is the bungee loop. This self adjusts to tension when you get in and out of the hammock. Whatever version of a Snuggler underquilt you decide on it will improve your comfort and cosiness when hammock camping. If you are venturing out in early autumn before any snow then I am sure the Slacker Snuggler would suffice. For anything in winter then go for the Super Snuggler or Down Snuggler for dry cold. 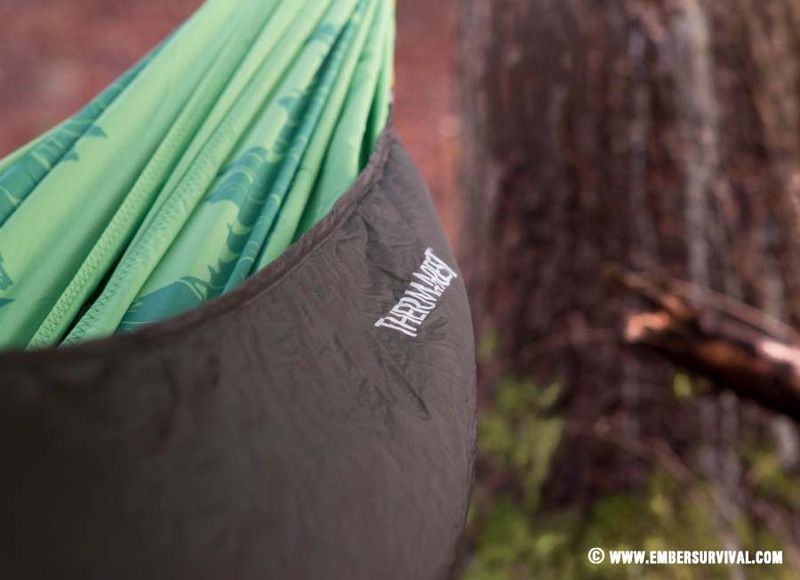 The Snuggler range comes in a storage bag that doubles as an extra pocket for your hammock when you have it pitched. The size of the pocket will fit a Kindle or headtorch and other small items. I find the pocket to be frustrating, so I instead string up a ridgeline of paracord above my head and hang things on that. It is super easy to pitch and adds much needed warmth to those colder nights. For the coldest of nights the warmer versions will allow you to stay camped out throughout the year. An issue is that the storage bag does not compress my Slacker Snuggler or Super Snuggler enough. So leave it out and stuff it in your rucksack directly to fill any odd gaps between items or get a proper stuff bag to reduce its rather bulky size before packing it.